Trying to find information about beer can be fun but it can also be tiring. Translating from Japanese into English or trying to find correct information is the most tiring parts, and no beer so far has been more tiring than Yokohama Bitter Ale from Yokohama Beer. I think. It’s a 5.5% English pale ale that is a collaboration between Yokohama Beer and Spring Valley Brewery Yokohama to celebrate 150 years of Yokohama opening up to foreign trade. Yokohama Ale can be found in bottled form and also on tap at both of the breweries bars. Does a beer exist only in pictures once it has been drunk? I don’t remember how I stumbled across Yokohama Ale; it was either at World Gourmet or probably Aka Renga Soko (Red Brick Warehouse) in Sakuragicho. It wasn’t cheap either at ¥648 per bottle so let that be a lesson to those looking for a spur-of-the-moment purchase. Yokohama Ale poured out a deep bronze colour that appeared hazy but that was more than likely due to the sudden condensation forming on the side of the glass. The head was minimal but was creamier than I expected for a bottled bitter though there was no special widget in the bottle to induce that nitro-head. The aroma was a nice mix of caramel malts and some slight bitterness from hops inducing a little bit of citrus too. Drinkabilitywise™, it’s easy enough on the palate so drinking three or more wouldn’t be a problem besides on your wallet. The malts produced a smooth caramel flavour that was sweet but not OTT; however, perhaps calling it a bitter – the British English word for a pale ale – would be doing others a disservice because Yokohama Ale is such a faded English Pale Ale that it doesn’t really belong in the group. 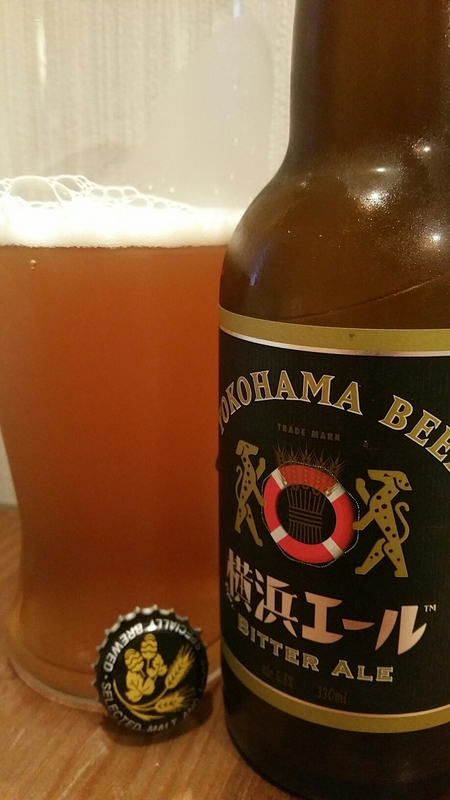 Yokohama Ale is nothing special and average at best. At this price though, give it a wide berth.